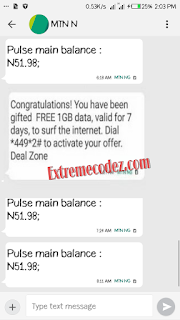 Mtn is currently dashing subscribers 1GB free data to browse and as well chat on WhatsApp for free we know 1GB is no that big but at least it will help most of the internet users. Dont forget that this same MTN is also rewarding subscribers of 100MB and 1GB free data when you download and install MTN MyApp application. 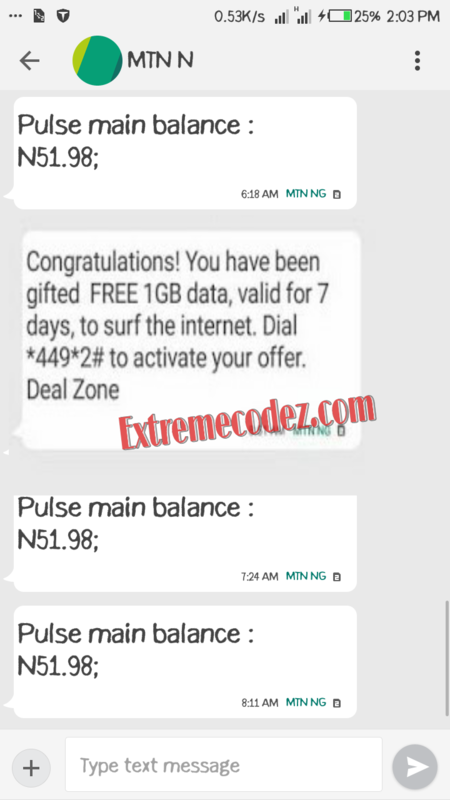 This is not a cheat or tweak unlike the mtn unlimited free browsing that we dropped on this site and it no longer working since days ago, this is official from the mtn network provider and it doesn't require any special code to activate this free data. MTN is sending an official SMS to users, confirming their free 1GB data. Congratulations! You have FREE 1GB data to chat on WhatsApp and browse your favorite websites. Bonus is valid for 7 days. If probably you received the above Quote text message from MTNFreeData, then surely you have gotten it. But if you didn't receive such, then dial this code *559*4# to check your data bonus to confirm if you have been given already or not. Note: Bonus is valid for just 7 days, and data can be used on any internet enabled device. Don't be left out allalways visit this site for latest free data, free airtime and free browsing cheats for all network. MTN is also rewarding subscribers of 100MB and 1GB free data.